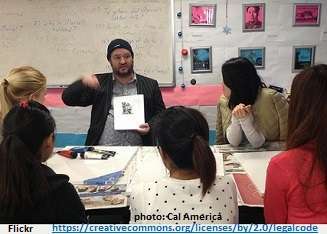 These ESL activities give students a chance to use what they have been studying and really make it ‘theirs,’ so they can draw on it when needed in their lives. They provide a variety of ways to practice structures and vocabulary students have been learning, at first with some guidance, then more and more independently. Most of these activities can be adapted to many different lessons. Several are especially useful as icebreakers, warm-ups, breaks, or a quick review when there's a little time left near the end of class. Icebreakers help classmates get acquainted at the start of a new class. Warm-ups are good at the start of a lesson, especially if not all students arrive on time. They can review the previous day's lesson or help students switch their thinking to English. It's also very helpful to have a few quick activities in your toolkit for when students get bored or discouraged. Some of the most valuable teaching advice I was ever given: Always have a back-up plan. Have one or two special activities in mind to keep students interested and productive if the planned lesson turns out to be too hard or too easy; if not enough students show up or they are unusually tired or restless; or the equipment needed for the planned lesson doesn’t work. 1. Find someone who (An activity in which Intermediate students ask many classmates questions from a list until they get a positive response and signature for every question possible.) I liked using this as a warm-up related to the day’s lesson or a review of previous lessons. If we were working on the past tense, the worksheet would start “Find someone who went to the beach this summer...” ; if on the present perfect tense, “Find someone who has broken an arm or leg” then “Find someone who has been to Disneyland...”, etc. Working with mixed level classes, I often gave my beginners the questions themselves so they wouldn’t have to try to convert from third-person statement to second-person question. The basic point is to practice related questions over and over, while learning a little about your classmates. 2. Odd One Out (to practice categories). The teacher gives sets of words that can be grouped in various ways-- with all but one of the words fitting in each possible grouping. (See top of the linked page for a better explanation and examples.) Each student in a group gives his/her opinion and explains why that item is different, and then the group decides which explanation makes the most sense. 3. ESL Café’s Idea Cookbook: Icebreakers. Over 100 first day icebreakers submitted by ESL teachers. I haven’t used these, but the ones I looked at looked promising-- and planning the first day of class can be a challenge! 4. Short dialogs let beginners practice common, most-useful phrases for situations they may encounter in daily life before they have enough English to improvise on their own. Dialogs are especially useful for greetings and introductions, asking or giving directions, telephone etiquette (asking to speak with someone, leaving a message, etc. Phone conversations are especially difficult because there are no visual clues to meaning.) For High Beginners or Mixed-Level classes, dialogs can be a good guided practice before trying a role play. 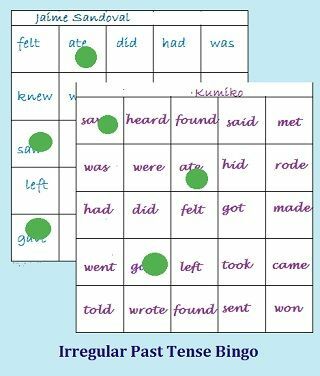 Dictations, like Bingo (below), encourage students to link what they hear to words they know; practice vocabulary and maybe spelling, and (if you give full sentence examples for each word), have the advantages of context and exposure to correct sentence structure. I have seen beautiful spiral-bound illustrated books put together by ESL classes (with a little teacher editing) to share with other classes in a large adult school. One of them was stories dictated (and illustrated) by individuals about their childhood homes. Another was refugees telling what they wanted to share about their experience. 13. Jigsaw readings: Students are divided into groups of 4, each with students A,B,C, and D. They leave their groups to read together with other As or Bs, etc. (All As read certain info, all Bs something else) and after understanding and discussing the reading with other Bs or Cs, everyone returns to their initial groups and must teach the info they’ve learned to the rest of the group. This of course requires much more talking (as well as reading mastery) than simply having all read the same information initially. Group division can be arbitrary by the teacher or based on student interests or experience. Almost any reading that divides well into sections can be used. In my classes we have used this to study information about different community organizations. It could be used for test preparation (especially for ELL students with other subjects to master in English, perhaps working in study groups), job-related or technical information, or field trip preparation. 15. Bingo (very popular and good hearing practice, with all the advantages of a competitive game. Students can make up their own bingo boards with random order copying of words on the board. We usually did this with a lesson’s or reading’s vocabulary, but it also works for irregular pasts or other forms. It can help to review the words and their meanings first. I always give an example sentence after each word, both to clarify the word and so students have another opportunity to hear English sentence structure and their vocabulary in context. 16. The Question game (20 Questions.) This is one of my favorites as it’s good question practice and can fill as little or as much time is left in class. L.A. Unified has an excellent free pdf e-book, Tools for ESL Lesson Planning, that explains how to conduct many of these (and other) ESL activities in more detail: TPR, dialogs, info-gaps, corners, peer dictation, focused listening, and more, as well as some very helpful sample lesson plans. Another great source of varied activities is the British Council. They explain the value of each activity as well as how to use it in the classroom. Some of these ESL activities are quite simple and may not sound like much If you haven’t tried them, but if they consider the levels and interests of your class they can add a lot to a lesson. Enjoy your class, listen to their needs, and feel free to experiment. Home> ESL Lesson Plans for Teachers> ESL Activities. These free and inexpensive ESL classroom printable games are a quick way to add excitement to a class while providing effective practice. Encourage the repetition students need to internalize newly-learned English structures. Here’s a quick overview of ESL lessons and their planning, from beginning of class assessments to the key elements of a day’s plan and ways to integrate the different language skills. Most important of all: make the classroom a welcoming place where students can see their progress, help each other, and feel encouraged to keep trying, even though their English isn’t perfect.